The Oral-B Pro-Health Stages power toothbrush featuring Monsters, Inc. characters gives your own little one a screamingly good smile. Crest + Oral-B Stages helps kids brush their best with products designed to support healthy oral hygiene. 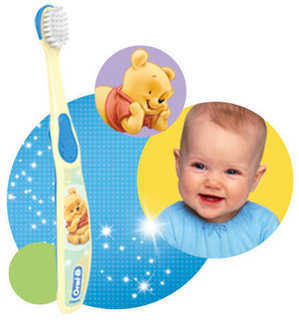 So get Crest + Oral-B Stages to help your little ones practice proper oral care habits that will last them a lifetime. At this stage of their evolving oral health, kids will be brushing both baby teeth and even some new teeth as their molars start to grow. Help them get the most out of their brushing routine with Oral-B Pro-Health Stages Monsters, Inc. power kids toothbrush. It's an advanced childrens brush with the added benefits of battery power, featuring a rotating PowerHead that reaches, surrounds and cleans multiple surfaces, interdental tips for between teeth, and extra-soft bristles. Plus, the shape is perfect for small mouths, putting the power of a spooky good clean in their little hands. This Stage 3 toothbrush is suited for children ages 5-7. Monsters, Inc.characters will help kids make every brushing a scary good time. Add Crest Pro-Health Stages Monsters, Inc.toothpaste to their routine. Bring their brushing routine to life with the magic of Disney and the expertise of Crest + Oral-B. Gentle products for babies 2-24 months. Perfectly sized for children ages 2-4. Recommended for the growing needs of kids ages 5-7. 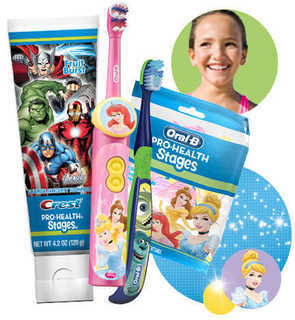 Still have questions about choosing the best oral care products for your child? Read below to find answers to commonly asked questions from moms like you. What are the benefits of brushing with a battery toothbrush? Giving your children the power of a battery brush can help them get a more thorough clean, even if their technique is less than perfect. How can I be sure Im choosing great oral care products for my child when there are so many choices? Crest + Oral-B Pro-Health Stages products are designed specifically to meet the oral care needs of every age of your childs development. When youre shopping in oral care, look for the Stages products that correspond to your childs age and you can be confident that youre choosing products designed to meet childhood needs. As my kids continue to grow, so will their needs. How can I be sure Im giving them great products while still keeping them engaged? 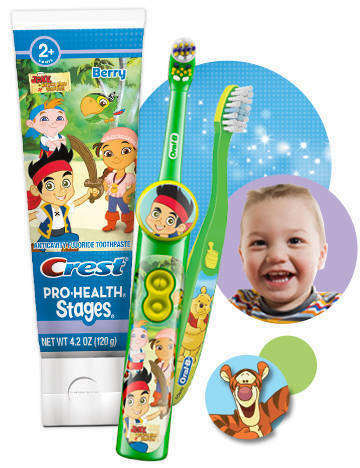 The Crest + Oral-B family of dental health products is designed to grow with your childs oral care needs. Starting them out with Stages and then graduating to Pro-Health For Me keeps you feeling confident that your child is getting great oral care products and keeps your child feeling encouraged to maintain their routine.